A FOGGY MORNING WITH SOME SMOKEY TALKS. LIGHTNING AT MY NATIVE PLACE. MAJULI : Majuli (মাজুলী) is one of the biggest and famous river island,which is situated in the NE region of Assam, India.It is the cultural capital of the entire assamese civilization, recorded from the age old evidences of the intellectuals like Srimanta Shankaradev(the pioneer of vaishnavism). The place have many monastries and prayer halls popularly known as satras or Namghars,where villagers episodically perform their religious rituals with the guidance of their religious guru called as the Satradhikars of Satras.Such that, Auniati satra, Kamalabari satra, Dakhinapat satra etc. where valuable antiques of the past like weapons, utensils, jwellery with other items of cultural significance are preserved by the people. During the autumn season "Rashleela" is celebrated with great pompous among the mass; where both childrens and adults participates in it. People from different corners of the world visits this place for learning dance form like Satriya, songs like Borgeet etc and also to have a spiritual attachment with God. 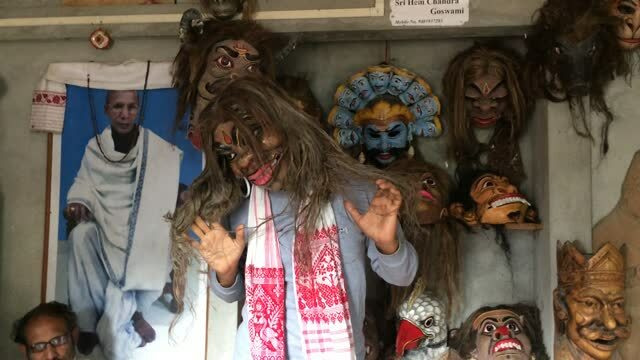 Majuli is an holy place for the Assamese society, it is a well known centre for learning various religious text, Satriya dance, holy songs, with various musical equipments. Sattriya or Sattriya Nritya:(সত্ৰীয়া নৃত্য):- is one among the eight principal classical Indian dance traditions. Recognized in 2000 as a classical dance by Sangeet Natak Akademi, the Sattriya is the most recent entrant in this list. Whereas some of the other traditions have been revived in the recent past, Sattriya has remained a living tradition since its creation by the medieval polymath Srimanta Sankardev in 15th century Assam. Tea culture is defined by the way tea is made and consumed, by the way the people interact with tea, and by the aesthetics surrounding tea drinking, it includes aspects of tea production, tea brewing, tea arts and ceremony, society, history, health, ethics, education, and communication and media issues.